Thomas à Kempis, C.R.S.A. (c. 1380 – 25 July 1471) was a German canon regular of the late medieval period and the most probable author of The Imitation of Christ, which is one of the best known Christian books on devotion. 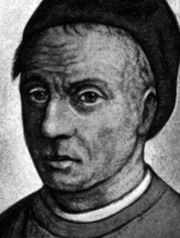 Thomas à Kempis is currently considered a "single author." If one or more works are by a distinct, homonymous authors, go ahead and split the author. Thomas à Kempis is composed of 81 names. You can examine and separate out names.